Saepe asperiores sapiente labore neque necessitatibus magnam rerum aut. Est et eos laboriosam. Perspiciatis consequuntur dicta et aut. Et qui ab alias a eius aut. Nostrum consequatur sed consequuntur pariatur illo sed. Enim eos ad fugit. Voluptatem vel recusandae ut rerum officiis occaecati. Soluta quia reprehenderit iure iste quia eveniet. Eveniet officiis dicta molestiae sunt sint est aut dolores. Omnis atque rerum et ut modi. Quia et reprehenderit mollitia non et. Aut assumenda at repellat ipsum non. 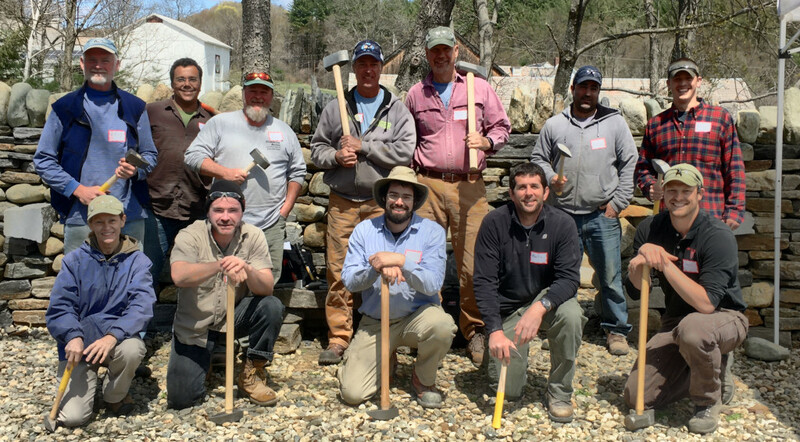 This workshop is perfect for the landscape contractor interested in starting to build dry stone walls, or expand that line of work. In addition to the hands on building of a wall, there will be discussions of good work practices, pricing walls, proper foundations, etc. - This one day workshop will teach proper preparation for building, with a focus on setting up batter frames and sorting stone. 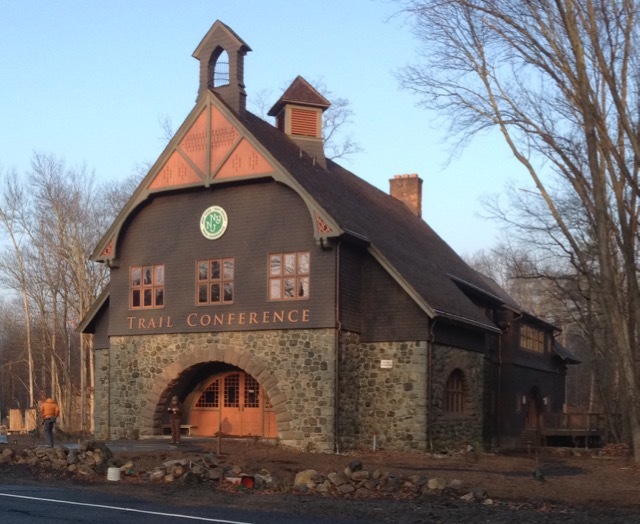 The Stone Trust is excited to announce this workshop being held in partnership with the New York–New Jersey Trail Conference. 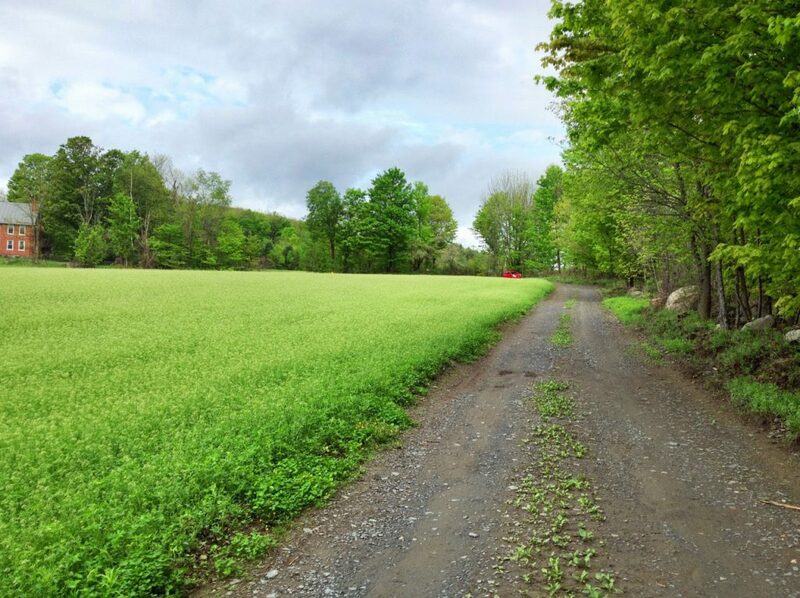 The Trail Conference partners with parks to create, protect, and promote more than 2,100 miles of public trails in the greater New York metropolitan area. More than 1,700 Trail Conference volunteers give over 93,000 hours per year building, maintaining, and monitoring some of the nation’s finest networks of foot trails. This workshop will spend ½ the day learning about how to shape stones for use in dry stone walls. Participants will be introduced to a variety of stone types, and how to work with them. Both hand and power tools will be demonstrated and used. This is the 2nd and final workshop to build a permanent wall in front of the Trail Conferences’s new headquarters at the historic Darlington Schoolhouse in Mahwah NJ. This workshop will complete a free-standing wall which will be three feet tall and run for over 160 ft. The wall will be built using the standard structural practices. The style of work will aim to match the historic dry stone walls and fences of the area. There are several cheek ends and curved section for the more advanced participants. Here in the North East, many of the walls people are building are retaining walls. While all the principals of a free standing wall apply there are additional rules and methods to follow when building retaining walls. The focus needs to be on a sound structure that will last for generations. Local round field stone will be used for this wall. The rules and principals learned here can be applied to all retaining walls whether hand-built or those built with equipment. This workshop will spend the day learning about how to shape stones for use in dry stone walls. Participants will be introduced to a variety of stone types, and how to work with them. Both hand and power tools will be demonstrated and used. The stone shaping portion will focus on efficient practices, learning how to look at a stone and judge how to shape it, as well as proper use and care of tools. This workshop is an excellent follow up to the women’s introductory workshop. It is open to all women, and ideal for women who have taken a prior workshop. Proper set up and use of batter frames and string lines is a real challenge for many wallers. We continually hear from examiners that poor use of string lines is one of the biggest reasons that wallers fail certification tests. You will learn multiple ways to build frames and use string lines to improve the efficiency of your building process and quality of the walls you build. This workshop is intended for those planning to take a certification test. Learning tips and tricks to help you pass, while you practice build for your test. This workshop will build a wall in the traditional Irish Feiden, or ‘Family’ wall style. Irish Family walls are a style that involve a mix of vertically and horizontally placed stones in a variety of sizes to create a distinctive pattern with stones referred to as “children, mothers, fathers” based on their size and who might have placed them in the wall. While it may seem counter intuitive it is very strong and fast to build. Sally Hodgson, the worlds only women who is a DSWA – GB Certified Master Craftsman is coming from Derbyshire England to lead this workshop! This two day workshop will be spent at the master features park building new sections of wall with a mix of stone. Participants will learn all the basics + so much more. Two-day workshops offer more hands-on time working with stone, and more time for questions from participants about individual projects. With many talented wallers and instructors around throughout the weekend the workshop provides an amazing learning environment for all. This workshop will build a wall in the Scottish ‘Galloway’ Style. Galloway walls feature a single stack of large stones on top of a double stack of small stones. While it may seem counter intuitive it is very strong and fast to build. Traditional in the South West of Scottland, this wall building style can be found around the world when the building stone has a wide variety of shapes and sizes, with many large stones. 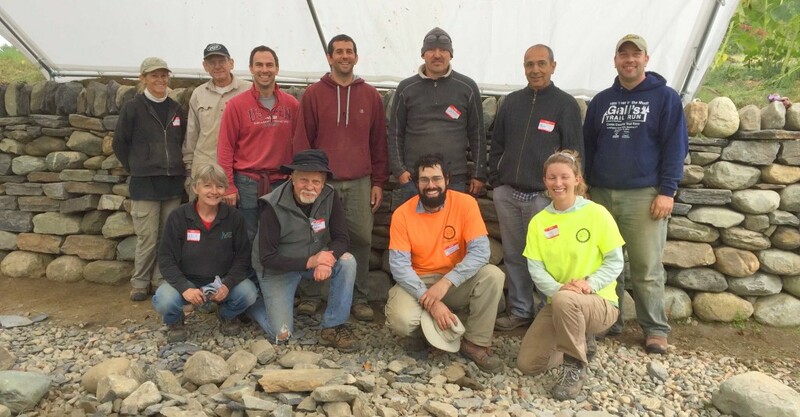 Become a Certified Dry Stone Waller, or increase your level! Dry Stone Wall Certification is a must have for the professional waller or landscaper, and fun to have for homeowner and hobbyist too. Each test involves dismantling and rebuilding a specified section of wall in a 7 hour time limit. Level 3 and 4 also include untimed feature builds. Each level increases substantially in difficulty. Becoming a certified waller will help you build better and faster. As more and more clients become educated on the benefits of using certified wallers, it is becoming a needed credential for professionals. Those who become Level 2 certified, can then take the instructors certification course and teach stone walling. Workshop Level: 1. Up to 16 participants with 2 Certified Instructors. Open to everyone. $200 This workshop is excellent for dry stone walling for the contractor, homeowner, hobbyist, or anyone interested in Dry Stone Walls. Workshop participants will learn the needed site preparation for building a wall. Participants will be lead through discussions of sourcing and selection stone to use, and preparing the foundation. For the better part of the day, participants will be learn from and be working along side the instructors setting up batter frames and sorting stone for building. 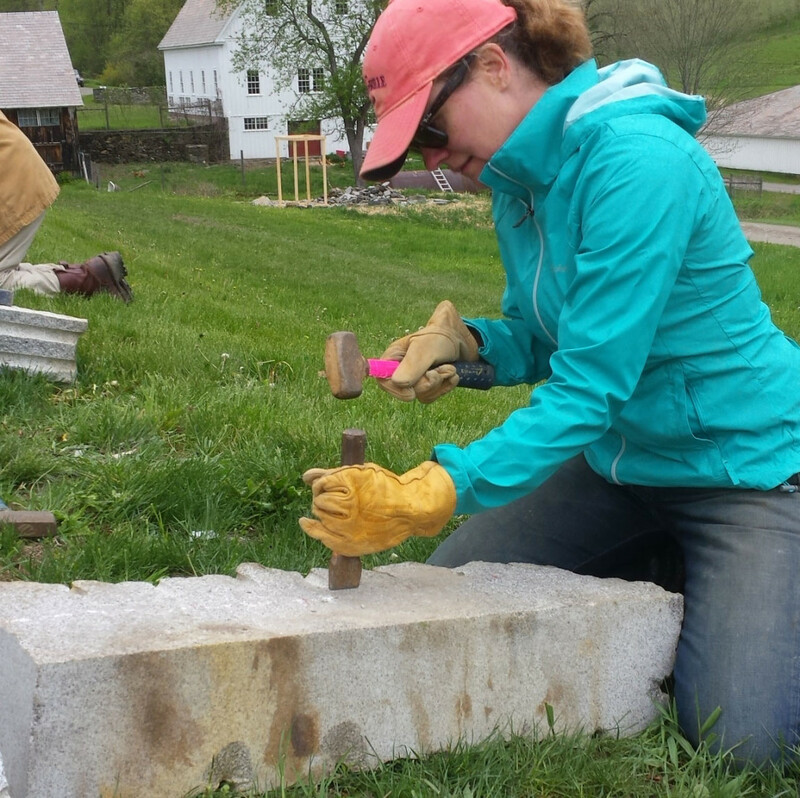 Learn how to rebuild a historic field wall in a beautiful Vermont setting. Master Craftsman, Brian Post, will be the lead instructor along with Seth Harris (DSWA Certified Level 2). 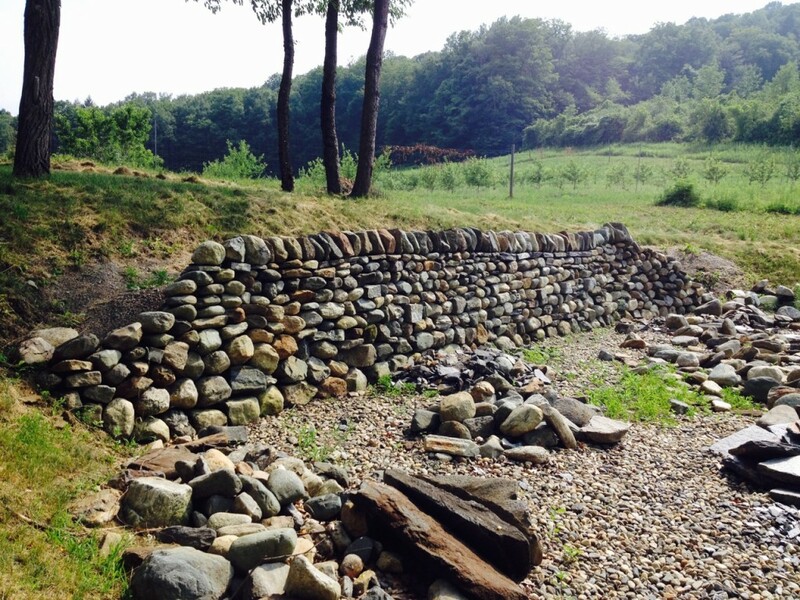 Participants will be guided through all aspects of rebuilding a dilapidated field wall using the local field stone. Workshop Level: 1. Up to 16 participants with 2 Certified Instructors. Open to everyone. 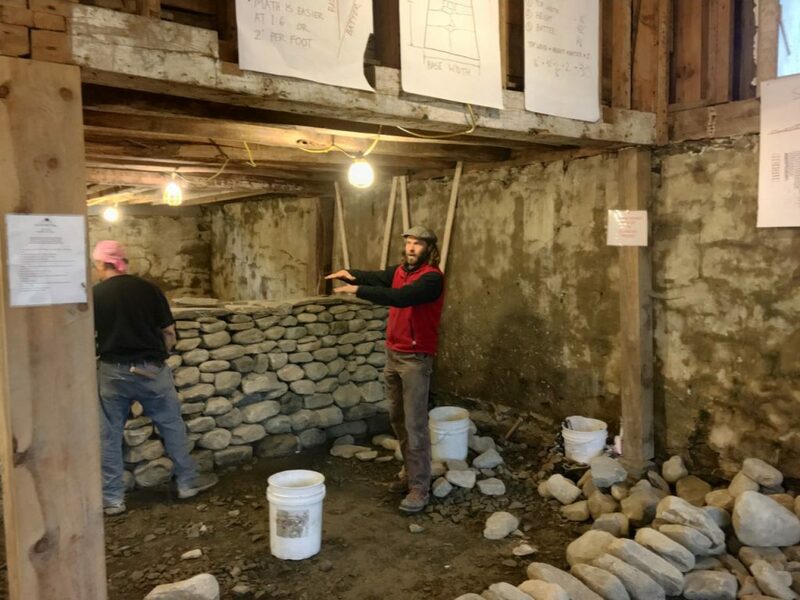 $200 This workshop is an excellent introduction to dry stone walling for the homeowner, hobbyist, or anyone interested in Dry Stone Walls. Workshop participants will learn the needed site preparation for building a wall. Participants will be lead through discussions of sourcing and selection stone to use, and preparing the foundation. For the better part of the day, participants will be learn from and be working along side the instructors setting up batter frames and sorting stone for building. 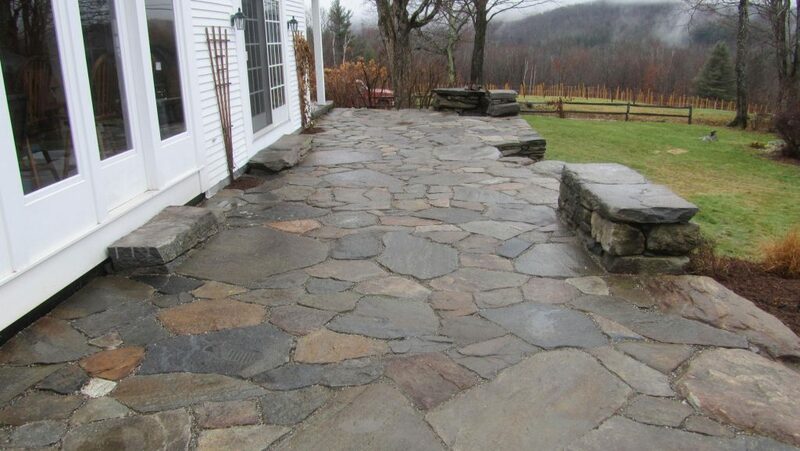 Learn the fundamentals of dry set flagging for patios and walkways. 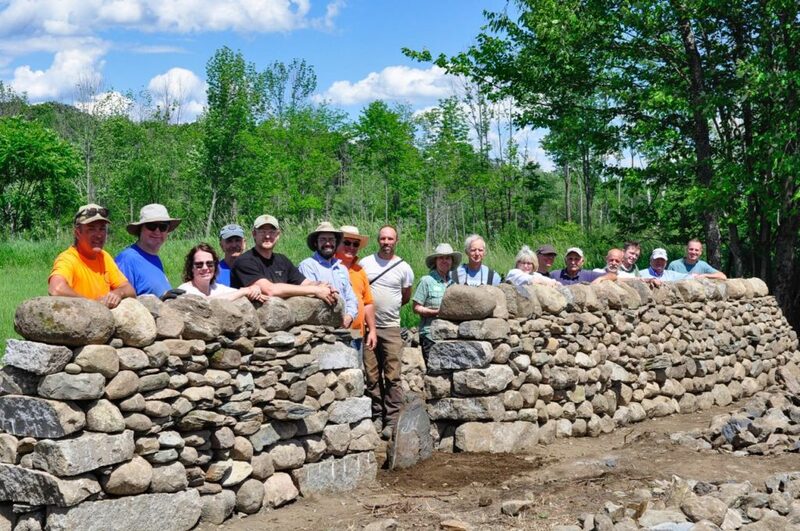 Learn how to build a traditional dry-stacked stone walls with special guest instructor Peter Isherwood, who is coming to The Stone Trust for the first time from Lancashire England. Master Craftsman Chris Tanguay (Maine) and Kim and Jerry Coggin (Pennsylvania, both DSWA-GB Certified Level 2) will also be teaching. Workshop Level: 1. 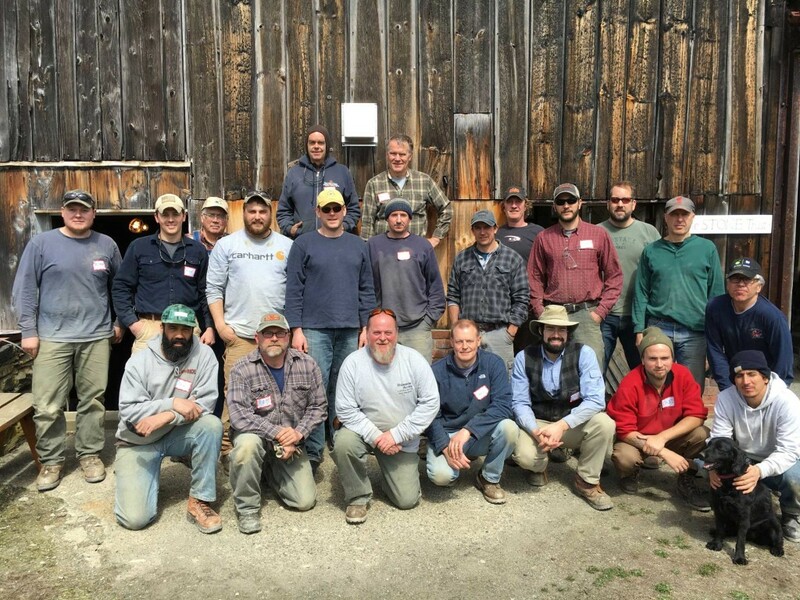 Up to 16 participants with Learn how to rebuild a historic field wall in a beautiful Vermont setting. Advanced certified (DSWA Level 3) wallers, Brian Fairfield and Matt Carter, will be the instructors. Both from Maine, Brian is the leading force behind the “Best of Show” builds at the Boston Flower Show for the last three years, and Matt is one of the key builders of the exhibits. Participants will be guided through all aspects of rebuilding a dilapidated field wall using the local field stone. This workshop is an excellent introduction to dry stone walling for the homeowner, hobbyist, or anyone interested in Dry Stone Walls. Workshop participants will learn the needed site preparation for building a wall. Participants will be lead through discussions of sourcing and selection stone to use, and preparing the foundation. For the better part of the day, participants will be learn from and be working along side the instructors setting up batter frames and sorting stone for building. 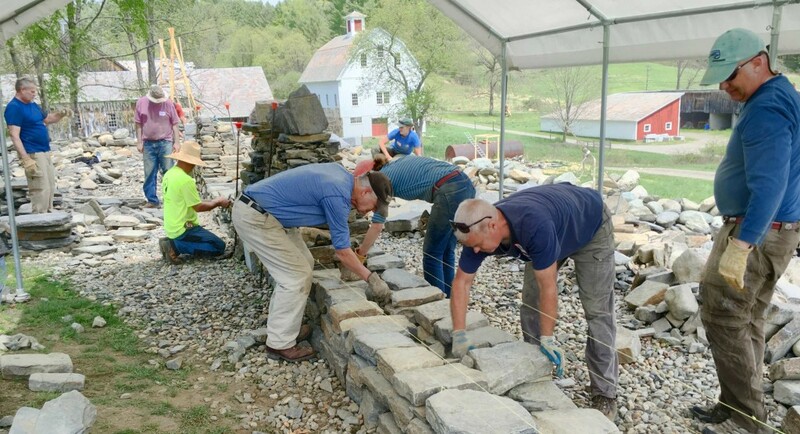 Learn how to rebuild a historic field wall in a beautiful Vermont setting. Advanced certified (DSWA Level 3) wallers, Brian Fairfield and Matt Carter, will be the instructors. Both from Maine, Brian is the leading force behind the “Best of Show” builds at the Boston Flower Show for the last three years, and Matt is one of the key builders of the exhibits. Participants will be guided through all aspects of rebuilding a dilapidated field wall using the local field stone. 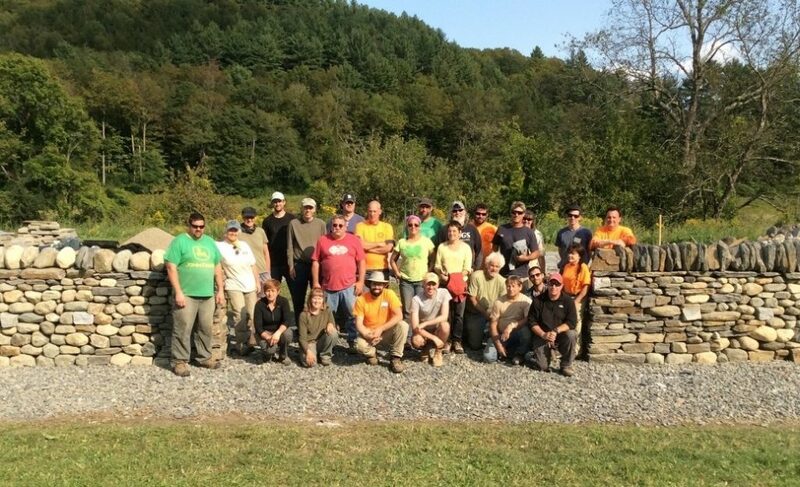 Learn to teach dry stone walling and become a certified instructor! After taking this course you will know the fundamendtals of teaching walling. A very informative and fun learning experience. For level 2 or certified wallers only. Here in the North East, many of the walls people are building are retaining walls. While all the principals of a free standing wall apply there are additional rules and methods to follow when building retaining walls. The focus needs to be on a sound structure that will last for generations. Local round field stone will be used for this wall. 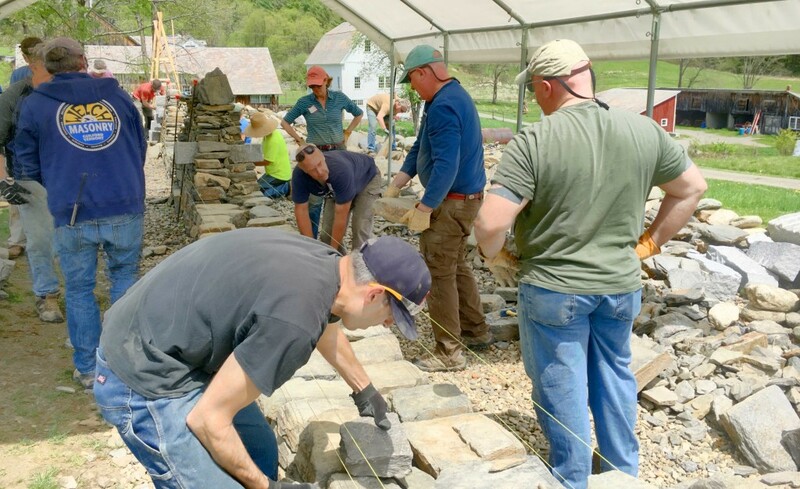 his workshop is perfect for the artist, homeowner, landscaper, mason, or enthusiast looking to start learning about how to build dry stone walls, or to improve your skills. 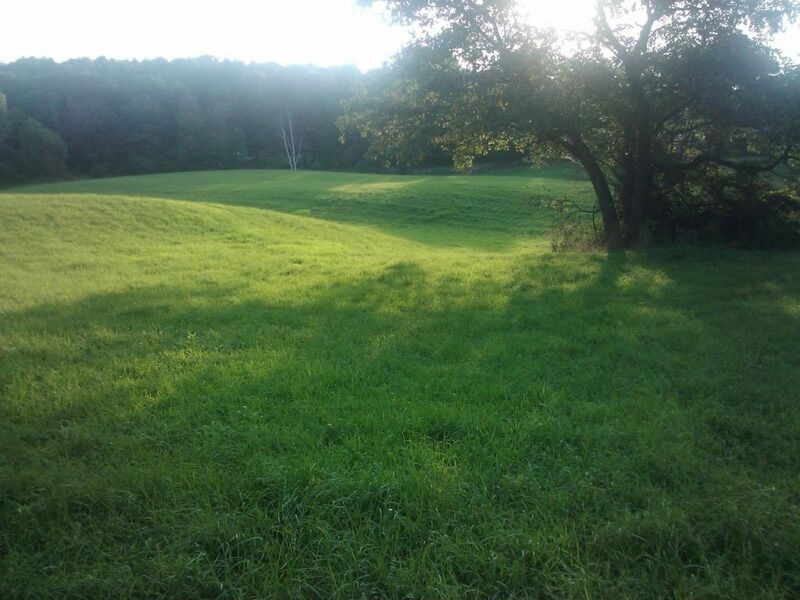 We will be building a permanent wall on Scott Farm will incorporate some artistic features. The wall will be divided up into panels with old granite curbstones set vertically. Each panel will be built in a regional style or have artistic patterning in the courses and types of stone being used. We will also be incorporating some small niches into the wall as well. The image below gives a good idea of the plan. The final designs will be determined by the stone available, and the visual statement. Learn to carve slate! In this workshop participants will learn techniques for carving slate, and then apply those techniques to create permanent signs for The Stone Trust’s Master Feature park. Testing Levels Initial, Intermediate & Advanced. Monday, May 7, 2018. NOTE: You must hold the previous level certification to sign up for any test above level 1. Click here to return to test day information page. THE REGISTRATION DEADLINE IS Monday, March 26th! NO LATE REGISTRATIONS WILL BE ACCEPTED. Already been to workshop? Want to build more but don’t have a wall to work on? Than this walling day is for you! Come work on a wall along side a few experienced wallers and instructors. This is a day for you to gain experience without lots of dedicated teaching time. There will still be instructors around to answer questions and help with trouble spots. This walling day will help you gain confidence in your walling and practice in a real world environment with irregular field stone. The atmosphere will be nice and relaxed. 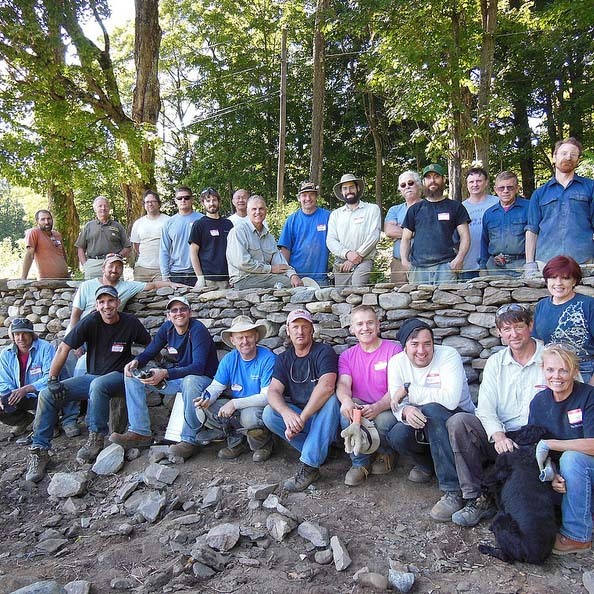 Learn how to rebuild a historic field wall in a beautiful Vermont setting. Participants will be guided through the preparation for rebuilding a dilapidated field wall using the local field stone. This workshop is an excellent professionals, homeowners, hobbyists, or anyone interested in Dry Stone Walls. Workshop participants will learn the needed site preparation for building a wall. Learn about the amazing dry stone bridges (and perhaps a few mortared ones) of Southern New Hampshire. This guided tour will get you an up close look at some of the best historic examples of dry stone bridges in New England. Open to everyone! Learn the fundamentals of building dry stone arches. This course will focus on building arches up to 3 feet in diameter. Work with natural stone to create artistic and structural builds. This workshop will spend the day learning how to shape stones for use in an arched bridge. The main priority will be making the voussoirs (tapered stones forming the arch). Both hand and power tools will likely be demonstrated and used. This stone shaping workshop will focus on making the stones needed for the bridge build in September. However, these techniques can be applied to all kinds of stone shaping and walling. The assumption is that participants taking this workshop already know at least the basics of dry stone walling. This workshop will delve into stone shaping and to a much greater level of detail than workshops that focus on wall building. Here in the Northeast, many of the walls people are building are retaining walls. While all the principals of a free standing wall apply there are additional rules and methods to follow when building retaining walls. The focus needs to be on a sound structure that will last for generations. Local round field stone will be used for this wall. This workshop will spend the day getting ready for the bridge building. 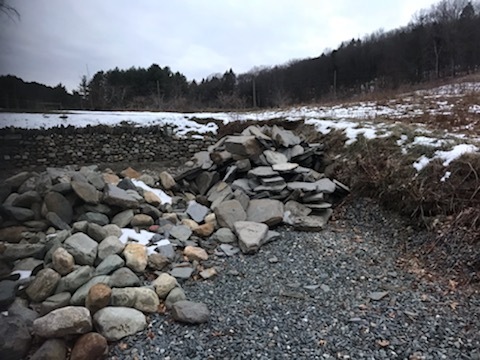 We will be finishing excavating for the foundation, setting in foundation stones, building and placing the form work, and other tasks needed to get ready to build a bridge. This is the workshop where you will really get to see all the components laid out and learn math behind the design and more. Southwestern New Hampshire is dotted with historic arched stone bridges. Most of these were constructed between 1840 and 1880. Many are still standing and in fact carrying traffic today! The forces of geology, technology and economics combined in the period from 1830 to 1875 to drive a bridge building boom in southwestern NH. Dry stone arches were the material of choice for heavily traveled routes that had modest spans. Foreign stone masons hired by the railroad brought technology and technique. Yankee ingenuity and economics did the rest. The Stone Trust Bridge Tour will guide you to see 11 of these bridges that are still standing. Four still carry daily traffic! From the iconic to the forgotten, our tour will explore each of these in a day-long journey around this corner of NH. This workshop will teach you how to assemble a bridge or arched structure. You will install voussoirs while learning techniques for achieving long term stability in a bridge. You will gain a practical understanding of where compromise is appropriate, and how construction techniques play to the physics at work enabling the bridge to function. You will build barrel vault and the side walls of the bridge and set copes. Cost: $1580. Learn all stages of building a dry stone arched bridge, saves . This package deal includes 5 days of advanced workshops with some of the best wallers and instructors in North America. Testing all Levels Monday, Sept 24th, 2018. NOTE: You must hold the previous level certification to sign up for any test above level 1. THE REGISTRATION DEADLINE is MONDAY, August 13, 2018! This walling day is an excellent introduction to dry stone walling for the homeowner, hobbyist, or anyone interested in Dry Stone Walls. 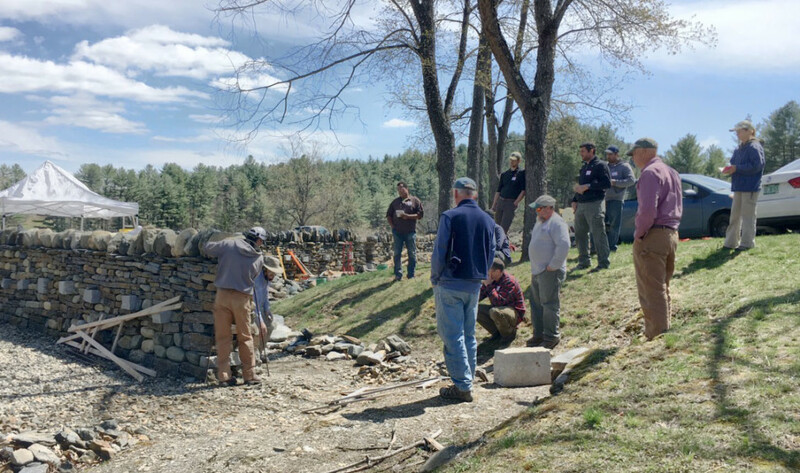 Over the course of the day each participant will get to learn and practice dry stone wall building under the watchful eye of skilled instructors. Help be part of setting up this new dry stone training site! Stone craftsman, Jamie Masefield, will show the different styles of walling that have developed over many centuries in Great Britain and how these have worked for inhabitants of different areas based on the materials that were available to them. This workshop is intended, landscaper, mason, or dedicated enthusiast looking for formal training in building dry stone walls. Hosted at Stoneyard, the workshop will take place with stone they sell in a heated indoor warehouse. Start the building season of right! Neil Rippingale (Scotland) Master Craftsman ~ DSWA-UK, DSC-USA Examiner. 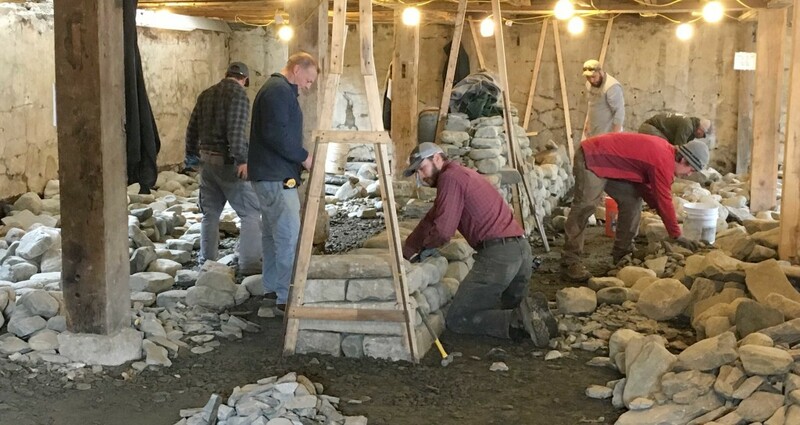 This two-day hands-on workshop is designed to teach the structural techniques and aesthetic considerations involved in building a dry stone wall (a wall without mortar) using stone native to our region. 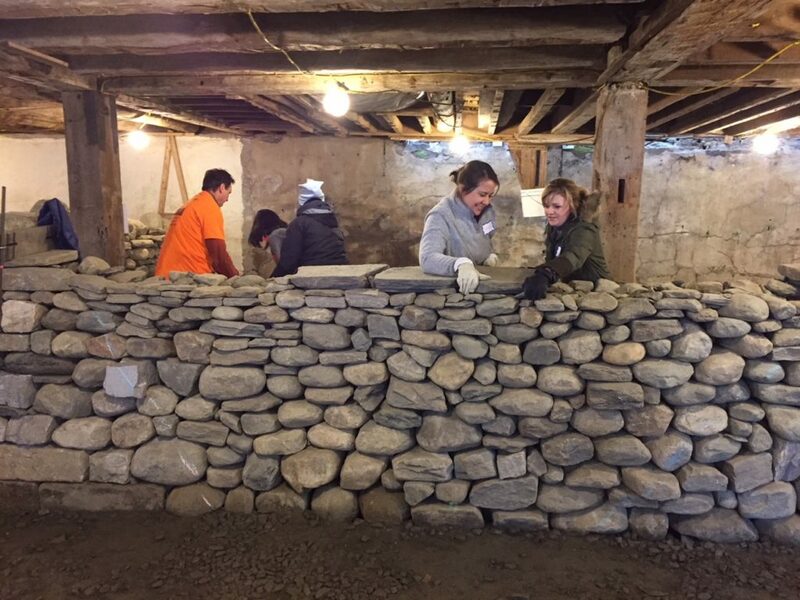 Come join some skilled DSWA-GB wallers and Certified Master Craftsmen, building a new section of wall at The Stone Trust Center on Scott Farm. We have a retaining wall site all prepped out, and stone to use up. Maybe we can even work in some fun details or walling styles. This is a great time to work on practicing your walling, learning some new tricks and networking with fellow wallers. Level 1 or higher DSWA-GB Certification required to attend. Pro member attend free, basic members just $20. 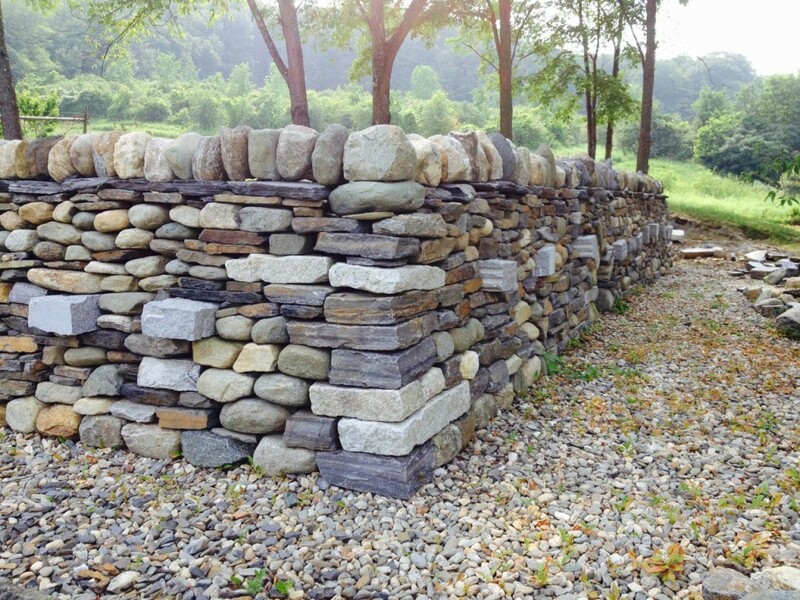 Join Master Craftsmen Jared Flynn and Brian Post on a guided tour through the stone walls at The Stone Trust Training Center and Master Features Park at Scott Farm. There are over 5000 sq ft of walls and features to see and learn about. 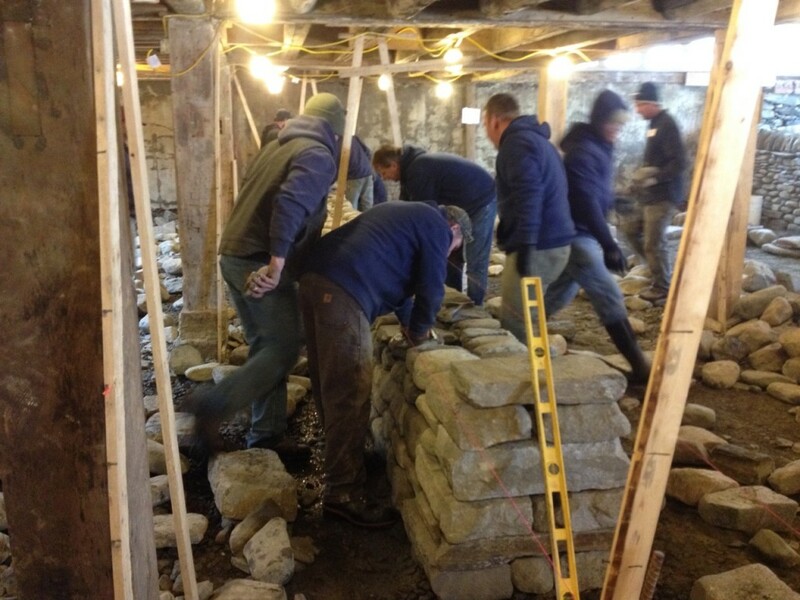 The Stone Trust has the only permanent indoor dry stone wall training facility in North America. Outdoors in the Master Features Park there are dozens of sections of walls to see built in different styles, and with varying stone types. The Walling Skills Intensive (WSI) workshop is intended for the intermediate waller who desires to test for Level 2. Gain the needed skills, practice building to the required standards and speed, and get a mentor to help you gain certification.